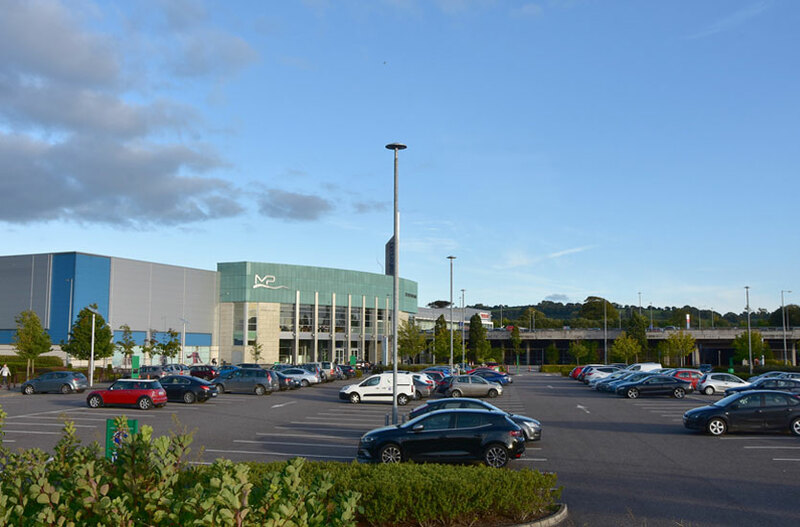 September 2018: Mahon Point Shopping Centre in Cork is one of the largest Shopping Centres in Ireland. Recently they became the first building in Ireland to gain and retain BREEAM in use certification, which is a certification of the sustainability of a building. They have also refitted their external car park lighting from Metal Halide to LED. The existing lighting was replaced on a 1 for 1 basis. The original poles were retained and reused for the new lights. 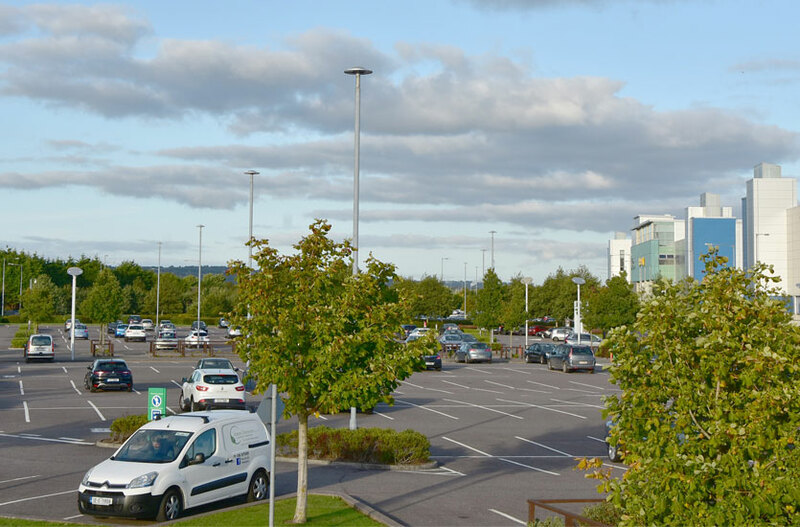 The car parks at Mahon Point have over 2000 car park spaces. 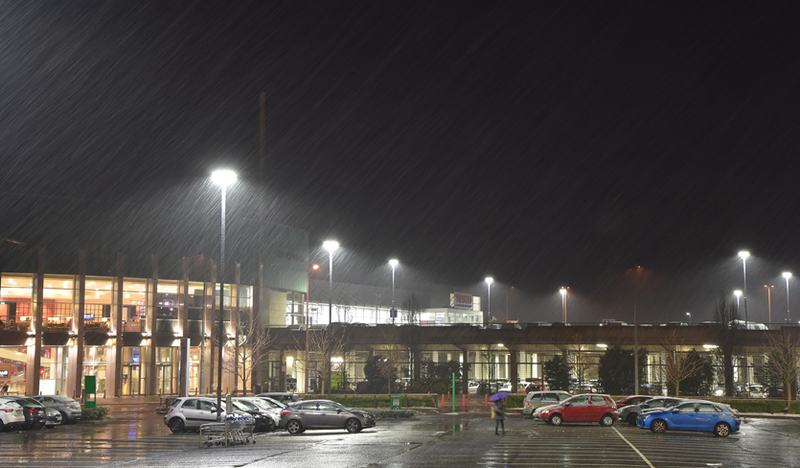 These car parks are now illuminated using 34 of VeeLites SupraLED Luminaires – typically 1 light for every 60 car park spaces. The previous lighting consisted of 4 x 400w Streetlights per pole, which used 1.8 Kws of electricity. The new lighting provides good quality white light and only uses 420w per pole, a saving of 76% in energy costs. 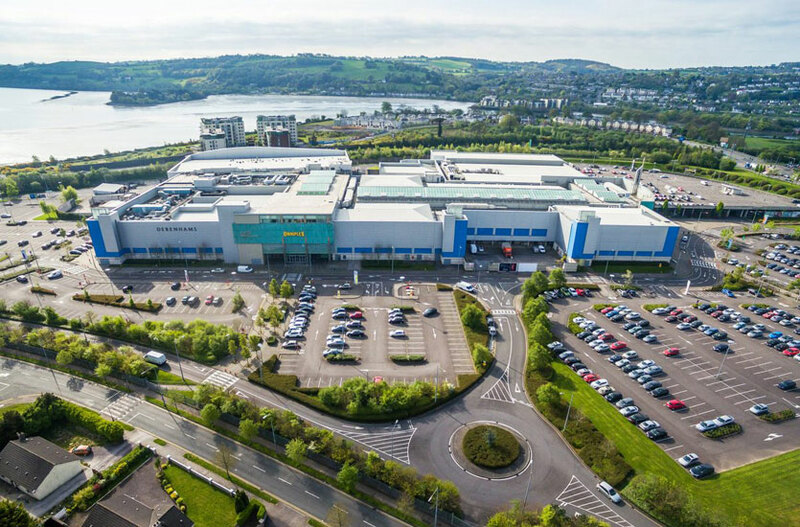 This aerial photo (or Click for Video) is courtesy of O’Callaghan Properties, who developed the Mahon Point Shopping Centre in 2005. Typically, these high performance SupraLEDs are installed on lighting poles between 6m and 12m height. They are ideal for new projects because of their wide spread of light and consequent savings in poles, concrete bases, underground wiring, installation etc plus the end result of more free space afterwards to use for car park spaces. 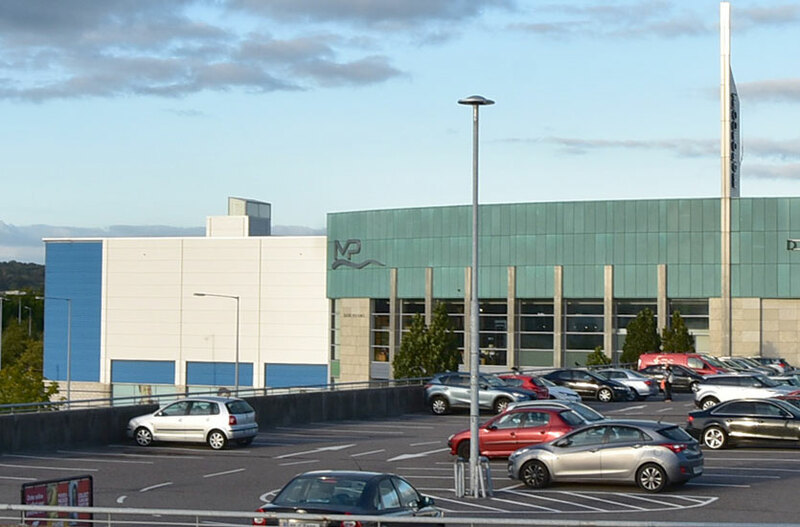 On refit projects such as Mahon Point, the SupraLED has the advantage that there will not be any dark spaces between the poles, as it is unlikely that any existing product is providing a wider spread of light. In this particular project, the lighting levels afterwards are more uniform (evenly spread) and easier for users, as eyes no longer have to adjust to high light levels under the poles and low lights between the poles. This is often an issue on car park lighting and one that the SupraLED is designed to eliminate. The Complex also includes a Tesco and a Debenhams at a higher level. The Photo below shows these Lights at night-time in the Rain. The Beam angle downwards is clearly visable and the Luminaires are dark-sky compliant. VeeLite offer a lighting design service (or photometrics) to customers or where no drawings exist (often on older projects), we can draw these up. Please send Autocad drawing by email. There is no charge or obligation for suitable Projects. We will calculate the number of light fittings required and advise light levels. We will advise where they should be located and the cost of the Equipment. Other lighting may need to be added for landscaped areas or to add decorative architectural effect.